Researchers have recently focused on the evolutionary consequences of the role organisms play in influencing their own environment in the short and long term; a phenomenon known as niche construction. It has been suggested that such organism-environment feedback can affect evolutionary dynamics in a variety of ways, from unexpected order, through to instability, chaos and sudden extinction. Organisms alter their environment in a myriad of ways. The changes so wrought can dramatically affect the fitness of individuals in current and future generations. We have investigated the role of spatial embedding in a genetic model of niche-construction. Spatial constraints make niche-construction more likely and can stabilize polymorphisms, a result of interest for the understanding of mechanisms that sustain biodiversity. Figure right. 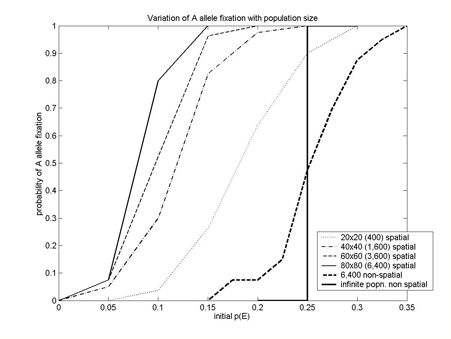 Variation of probability of A allele (resource consumption) fixation with (spatial) population sizes of 400, 1600, 3600 and 6400. No external selection at A. Non-spatial individual-based and population genetic data are included for comparison. Spatial-embedding enhances the fixation of niche-construction which occurs at lower values of initial p(E) (proportion of niche constructing allele) than in the non-spatial case (vertical line). Below. Evolution of a niche-constructing cluster in a 30 x 30 population, with initial p(E) = 0.15, after 100 generations. Snapshot of distribution of (left) A alleles, (centre) E alleles and (right) resource. Strong linkage disequilibrium is apparent. Silver, M. and Di Paolo, E. A. (2006). Spatial effects favour the evolution of niche construction. Theoretical Population Biology, 70(4), 387 – 400. Models that demonstrate environmental regulation as a consequence of organism and environment coupling all require a number of core assumptions. Many previous models, such as Daisyworld, require that certain environment-altering traits have a selective advantage when those traits also contribute towards global regulation. We present a model that results in the regulation of a global environmental resource through niche construction without employing this and other common assumptions. There is no predetermined environmental optimum towards which regulation should proceed assumed or coded into the model. Nevertheless, polymorphic stable states that resist perturbation emerge from the simulated co-evolution of organisms and environment. Typical run of the simulation with three periods of regulation. Left: resource over time (blue line); mean A is the mean resource level that the population is adapted to; the diagonal dotted line is the forcing target P; the horizontal dotted lines are the bounds of habitability outside of which life cannot survive. Right: stacked bar chart showing the number of individuals with the E allele (who increase the resource), and the number of individuals with the e allele (who decrease the resource). McDonald-Gibson, J., Dyke, J., Di Paolo, E. A., and Harvey, I. (2008) Environmental regulation can arise under minimal assumptions. 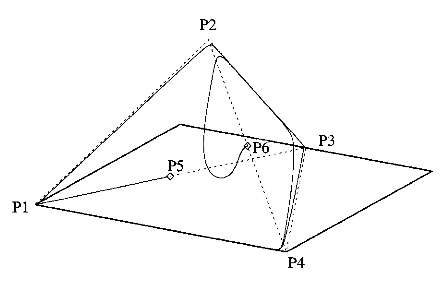 Journal of Theoretical Biology, 251(4):653 – 666. A character or behaviour is altruistic if it is costly for its bearer and beneficial to other individuals. Traditional explanatory routes for the evolution of non-reciprocal altruism have concentrated on its different effects on intra- and inter-group competition. It has been shown that altruism may evolve in viscous populations distributed in space. For a simple game of action and response with tuneable degree of conflict both game-theoretic and simple spatial models predict that altruism will not evolve (right). However, an individual-based model of the same action-response game shows strikingly different results (left). 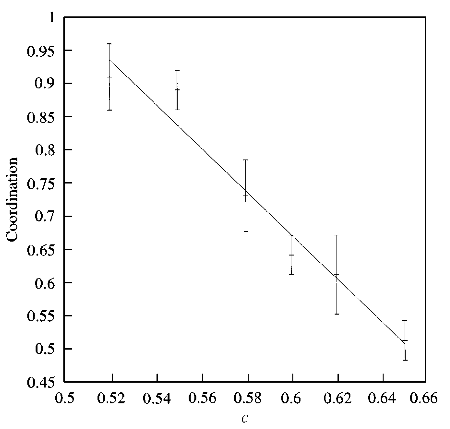 The degree of coordinated action (leading to sharing payoffs) is above the neutral expectation level (0.5) for degrees of conflict above the baseline (c > 0.5). The explanation lies in the combination of broken spatial symmetries around clusters of players and between local environments for cooperators and selfish agents. More efficient resource consumption by cooperators lead to lower resource equilibrium and acts as a defense barrier against selfish invaders who can only survive in more plentiful environments. This is essentially a niche-construction effect. Di Paolo, E. A., (2000). Ecological symmetry breaking can favour the evolution of altruism in an action-response game. Journal of Theoretical Biology, 203, 135 – 152. Di Paolo, E. A., (1999). A little more than kind and less than kin: The unwarranted use of kin selection in spatial models of communication. In “Advances in Artificial life” Proc. ECAL’99, Lausanne, Switzerland. D. Floreano, J-D. Nicoud, and F. Mondada, (eds.). LNAI 1674, Springer-Verlag, pp. 504 – 513.